For years I have tried to determine where Robert Cravens' 150 acre tract was located in relation to Robert Patterson Sr's 200 acre tract. I had assumed that when Cravens' survey was described as adjacent Robert Patterson, it meant Robert Sr, but I always knew there was a possibility it could have been referring to Robert Patterson Jr. Turns out, it was Jr. Recently, I began working on a presentation for Harald Reksten regarding this very issue. However, the actual process of documenting all of it helped to open several road blocks I had encountered along the way. The major discovery made during this process is that there had been at least two later deeds that made reference to separate deeds being "adj. John Patterson" - and that this Robert Cravens tract has to be the land that was later in the possession of John Patterson. Well, that has to be my ancestor John Patterson, son of Thomas, and grandson of Robert Sr. But there has never been any deeds or grants showing John receiving or disposing of any York Co SC land. The following map shows seven (7) primary tracts of land and their fairly accurate proximity to each other along Clarks Fork of Bullocks Creek in York Co SC. 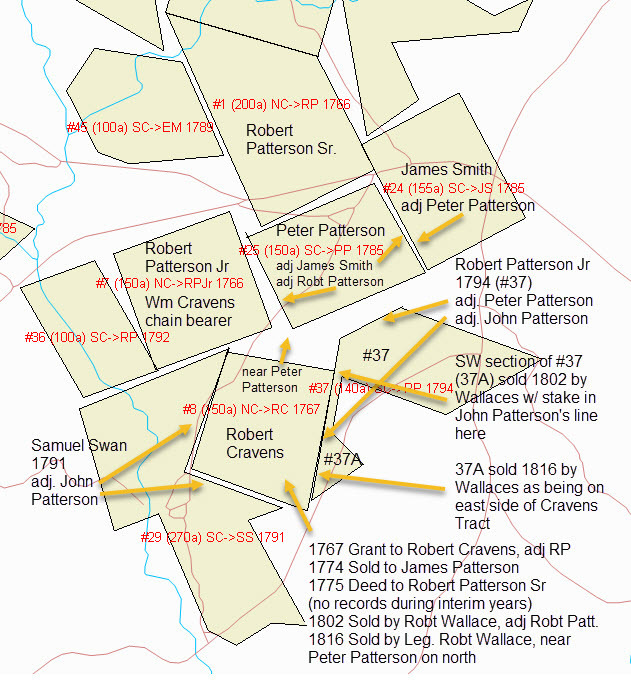 Robert Patterson Sr (who died in 1775) was the father of Thomas, Peter, James, Robert Jr, and William Patterson. He also had daughters who married Daniel Ponder Jr, John Black, and Joseph Black.